It’s only a matter of luck! The first obvious and essential condition to spot wildlife is travelling abroad. You cannot see a Mountain Gorilla while sitting on your favourite armchair at home, at least if you’re also curious about how its recurring flatulence sound like, or what does it feel when a silver back feint a charge and 200 kg of animal power comes over yourself. TV can’t give that today. But there is something that wildlife traveller –or wildlifetrotter- knows well: travelling is not enough. Even the search of the easiest species may turn up out of reach in intrepid adventure. 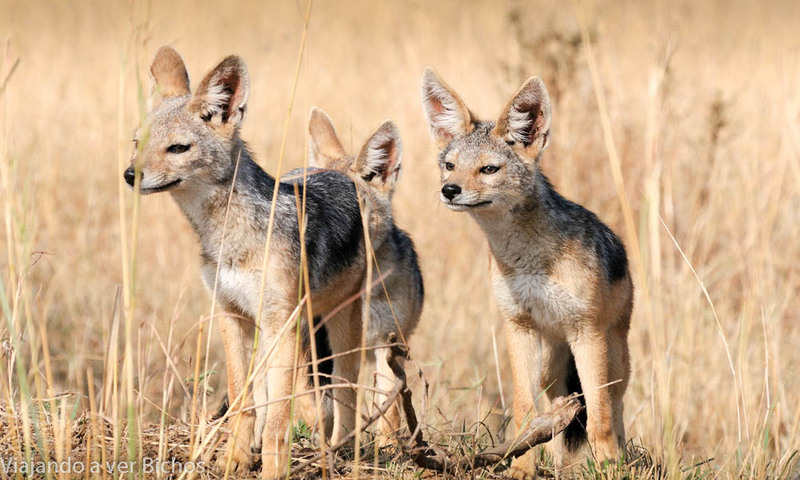 The Black-Backed Jackal (Canis mesomelas) is perhaps the easiest carnivore to spot in many African National Parks, (sighting difficulty 2). The species becomes indispensable in every safari. These cubs approached our vehicle out of curiosity. Know what? There are people, thankfully not so many, who look like touched by the Deity of Good Fortune. No matter what they do, they are going to see everything, till the most secretive critter nobody can find and all that without staining the garments in the slightest. I am not talking about them now, for jealousy. They do deserve the worst ;-) And then there are common people, like you and I, sharing the same group than the rest of mortals. We all have to strive hard, not to spot wildlife, but to try standing a chance. Today, only a few reliable specialized companies can guarantee that you will have a face-to-face encounter with “your critter”, despite you travel all around the world to find it. They claim it is largely a matter of luck, the so-called cliché “right time-right place”. In fact, my advice is to distrust those companies who cheap guarantee full chances, since this may not be entirely true and they are no more than waiting for your money, or the animals are subject to semi-captive conditions, which is not fully conveyed onto the client in advanced. However it might as well be truth, no manipulation at all and exceptional field guides on duty, but there is no doubt that it will have an effect on the fees; high quality services must be paid for. If you are planning a trip for a species in particular, it is a good thing to contact a reliable specialized company and ask them for a range of probability. For instance, if your target is the snow leopard at suitable areas in the Himalaya heights and you want to do it in October, then you get 40-50% chances to succeed. But if you do it right in the middle of winter, in December-January, then it rises up to 80%. This is useful and helps us plan our expedition, reduce potential risk and avoid frustration. On this blog we’d like to provide you with some little tips, in case our experience proves useful for you. You must have seen by now, we score with a simple scale ranging from 1 (very easy to spot) to 10 (virtually impossible in a single short stay) how likely it is to spot a species in particular, from our own experience. The bad news is this scoring system is merely illustrative, since random always has the last word. You can devote your whole life in search of a given species, just to find yourself in the end resoundingly defeated. We may tell a hundred stories as good examples. Let me tell you one with a happy ending. Joy is a good friend of mine and one of those extraordinary people to look out for when travelling overseas. Born in Kenya and South Africa based, one fine day she left everything behind in search of one of her life-time dreams, and so made her way to the far Chinese mountains, in search of the panda bear. Not much of an easy task for a woman travelling on her own to the country decades ago. Such an amazing quest took up her savings and had her busy for several months, but eventually she hit the target and managed to find out her big treasure. Back at home she realized that trip had changed her forever; the experience meant much more than simple bear watching and felt she would never be the same again. 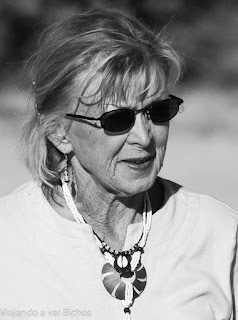 It was time to spread the wings and follow her own path by setting up a safari and expedition company to operate in Southern Africa (www.africanwildlifetours.com). Today she is an experienced guide and another inhabitant of Africa’s wilderness, sleeping along with the roar of the lion and the noisy skirmishes of spotted hyenas. This is my good friend Joy, an African legend who deserves a place in National Geographic's front cover . Joy’s eyes have seen things the vast majority of humans have not, but there was something she still had not spotted and was really longing for; the list was not yet completed nor her dreams fulfilled. 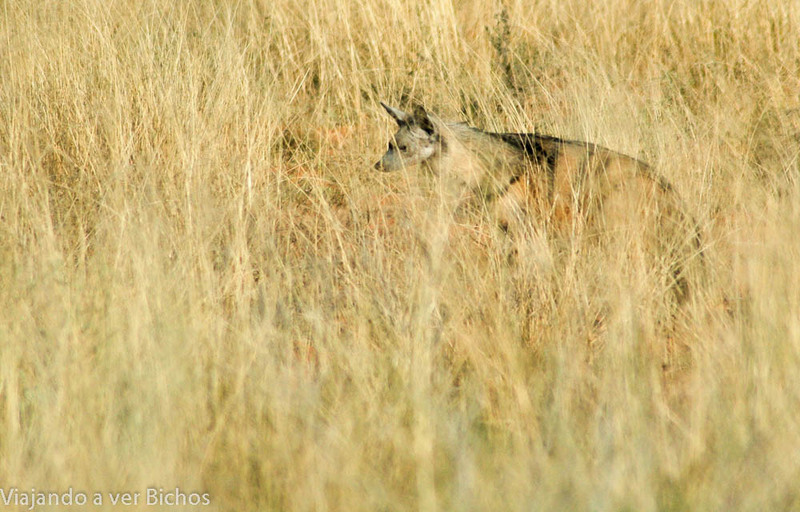 She long dreamt of watching “her ghost” the Ardwolf (Proteles cristata), in her opinion the most secretive and elusive dweller of the African bush. Every time we met for a safari either in Kruger or Kalahari, she used to tell about memorable moments and experiences with wildlife that she came across, but always regretted was still missing the ghost. At some point in life, she lost the faith that some day she could see that Holy Grail, who was turning harder than the pandas themselves at the other end of the world, years before. A sentinel meerkat or suricate (Suricata suricata) watches out for predators in its small realms in Kalahari Desert. We saw this on our way back to Mata-Mata camp with Joy (sighting difficulty 6). But one day, something unexpected happened as we were returning to Mata-Mata camp, after a wonderful safari wandering through the Kalahari. It had been a really good one; we saw a leopard and some brown hyenas, and even a tawny eagle carrying and fighting a cobra on the talons, as it overflew our very heads. We felt overjoyed and so called it a day; could not ask for more. Joy was driving but at a given time she suddenly halted the car. There was what at first glimpse looked like a black-backed jackal right in front of us, a few meters ahead and taking a nap on the road surface. That jackal looked a little strange, kind of weird. As we approached in, it grumpily got up and moved to give way to the unwelcome intruders who disturbed the peaceful nap. As Joy started the car again to get out of there, I suddenly screamed: Stop the car Joy, there you have your Ardwolf!! And God it was, unexpectedly and when all hope was gone. The ghost stood still for a while and stared at us mysterious, shy and curiously. The wolf was scruffy in some regards but also spectacular and cute. We were petrified by the scene and could not believe what was actually going on. One cannot see every day such a freak of nature. The only sound was the click of the cameras and the deep breathing from our agitated lungs. Then, gently and slowly, the desert ghost faded away behind a dune. Joy stared back at me and drew a smile in complicity, could not help a couple of teardrops running down her face though. That was quite an emotional situation. We never happened to see an Ardwolf again in our lives, but there was no need to. The magic of that moment was the best compensation to so many years waiting for. And finally Joy met her long waited Ardwolf (Proteles cristata), by sheer chance. Some get to see it easy (even score 1), whereas for most people it is a difficult-to-spot species (up to score 10). Either one way or the other, it is a three points basket. The moral of this story is that if it is your lucky day, you will see it even if you close your eyes; but if it is not you won’t, even if you get into the very den.